So, if you’ve been following my blog, you know that I like to write about just about everything. I’ve covered the NFL, NBA, MLB, and even the WWE. Usually I try to write about big topics and give my opinions on them, which is what almost every blog is, in some sort of way. So why would some small transaction by the Houston Astros Friday morning get me excited enough to write a blog post about it? Well, that small transaction involved someone close to me. 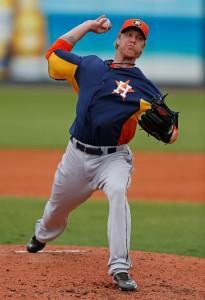 On Friday morning, the Astros called up right-hander Mike Foltynewicz, who was taken with the 19th overall pick in 2010 straight out of high school. That high school? Some small school in the southwest suburbs of Chicago called Minooka Community High School, the same high school yours truly attended. It was no surprise that “Folty” was going to get drafted in 2010. Ever since his freshman year, scouts had been looking at him, evaluating his great on-field talents. With a fastball clocking in around 97 miles per hour, it was hard not to notice the big righty. His senior year at Minooka was incredible, as he had a 7-1 record with an incredible 0.24 ERA and an astounding 95 strikeouts, all in just 56 innings of work. He helped carry the Indians to the sectional finals before ultimately losing. On the bus ride back from that loss, though, was a phone call that would change Flotynewicz’s life forever: it was the Houston Astros saying that they were going to select him with the 19th overall pick in the 2010 draft, becoming the first Minooka player to ever be selected in the first round of the MLB draft. The 6’4”, 220 pounder immediately reported to rookie camp that fall. The transition was initially tough for Foltynewicz. He struggled to find his groove in rookie ball, going 0-3 with a 4.03 there. Despite the minimal action he saw, Folty was promoted to single A Lexington the next season. Foltynewicz struggled again there, going 5-11 with a 4.97 ERA. 2012 was a different story, however, as he went an impressive 14-4 with a 3.14 ERA. He actually started the class A all-star game, showing that he was going to be a top prospect for the future. 2013 saw Foltynewicz go from single A, to A+, and then up to AA Corpus Christi in one year. While at AA, he went 5-3 with a 2.87 ERA, prompting him to be promoted to AAA Oklahoma City this season. While in OKC this year, Folty has struggled, going 7-7 with a 5.08 ERA. Despite an okay season in AAA right now, the Astros called up Foltynewicz to give him a feel for the big leagues before he gets called up full time next year. This story is so cool to me, personally. I remember he was a senior the same time I was a freshman at Minooka High School. Having a guy like him on the varsity team was something really cool to see, and the crowds that would come out when he pitched were outstanding. Seeing 15-20 scouts a game, with their radar guns to see how fast he was throwing, was truly a sight to see. I distinctly remember one game where he was pitching so fast, the game ended in just over an hour. AN HOUR! A seven-inning game usually takes 2-2 ½ hours. Not with Foltynewicz on the mound, though. He was something special to watch. It’ll be interesting to see how the Astros use him in the final two months of the season. According to an article on houseofhouston.com, Folty will be used primarily in a relief role, opposite of the starting role he’s been in for this entire process. The move to relief pitcher shouldn’t surprise anyone, though, as his fastball now hits up to 102 miles per hour, which is Aroldis Chapman-like numbers. The heater has contributed to his 102 strikeouts this year in AAA, which is also a big component for relief pitchers. Although he will be switching from a starter to a reliever these last two months of the season, look for Foltynewicz to become a starter on this Astros team in the near future, maybe even next season. One thing is for certain, though: he represents the city of Minooka with such class and professionalism and it has truly been incredible to see his rise in the Astros organization. It’s been great to see him achieve such great success so far, and at only the young age of 22, the sky is the limit for what his career could become. Thanks for reading. Also, thanks to my buddy Aaron Ladzinski for telling me about the great news this morning. Make sure to check out the other blogs I’ve posted, and stay tuned as I go more in-depth on all the things going on in the sports world. This is Game of Sports.